We need some volunteers with deep pockets and thick skin—to help me with the Garage Sale. After this year—after 18 years— I need help with what has been an individual effort—Not the BIIA—not the City—Just ME!!! It used to be fun. I didn’t mind taking a month out of my life to give to the people of the Island who appreciated what I was doing and I still feel proud that what started out 18 years ago as the Opal/Topaz Garage Sale has become what I envisioned all along—the Balboa Island Garage Sale. It is neat to see your vision come true. In the beginning everyone pitched in. Either helping me deliver flyers and with a donation to defray the expenses—which were not nearly what they are today. And we have always had Free Coffee from our Balboa Island Starbucks. Thank you to Ray and the gang!! This past sale cost $1400.00—event advertising and printing were most of the expenses. Approximately 100 of the 200 plus participants paid the fee—I collected $1000.00 plus a generous donation from my sponsor Sue Podany of Prudential California Realty of $250.00. Without Sue the Garage Sale would not have been possible this year. I still had a small amount of funds left from when Steve Bromberg was our City Councilman. Steve was a generous and enthusiastic supporter with his discretionary funds. The printing is all done at wholesale. The sign changes are done very inexpensively as a favor to the Island—Freedom and Beach Signmakers 949.752.8200. Dave Beach—great guy has done a lot of work for the Island and the City of Newport Beach!! I heard over and over this year that it was the best garage sale ever. The most participants—the most people. Yep—I know all the tricks to get the job done. I just don’t know how to get the “freeloaders” (not my term) to pitch in and pay the exorbitant amount of $10.00 each ( that is right $10.00—not $100.00) to cover the costs of putting on the When I tried to collect from the non-payers, these were the comments I got—”I have done this for years and I have never paid (this from someone who was selling racks of children’s clothes from a local store)” - “here is the $10.00—go buy yourself something nice !” “No one knows that you have to pay” “Just don’t buy anything at my location” !!! I guess it is what I have been told by all the long time locals—who, by the way, do follow the rules, and are appreciative. The newer people just don’t understand—don’t want to understand—don’t get involved—don’t want to keep our Island great. We had a very hard time finding a Chairman for the Parade this year—everyone wants to stand and watch—most don’t want to do the work. Everyone wants to make money at the Garage Sale—some don’t want to pay—even $10.00. And here is the kicker—the City has taken note of the size of our successful “event” and next year we will be charged $200.00 more for an “event” permit. The budget will be $2000.00 by next year. So . . . Ideas anyone. It has been suggested I raise the fee for the honest people who pay—print the names and addresses of those who don’t pay—or send out two guys to collect—get neighborhood block captains—or get a petition together and send it to the city to have them pay for the event. All of these take time. If you can think of something call me!!! Or I can just cancel the event—it isn’t nearly as much fun as it used to be!! HERE IS A FUN SOLUTION TO A PERPLEXING PROBLEM. If only cats could talk!. My cat, Magic, is very allergic to any food but his own. He was an indoor/outdoor cat when he ‘adopted’ me so changing that has been impossible. But he is a begger. He is also a thin kitty who looks undernourished. People feed him. Then he leaves the food on my carpet!! I got tired of having the carpet cleaned. I got an idea. I found a person on the internet who would put anything (no profanity!) on a collar—she put “Don’t Feed Me—Allergies” on the collar—END OF PROBLEM!!! If you have a similar problem the woman’s name is Lori—she is a very nice person and can help you 1.800.267.0501. When I moved to Balboa Island in 1990, I started a networking group called Balboa Island Networking Group (BING). One of my favorite members was a lady named Maybelle Gargano, my neighbor on Topaz. Maybelle was about 80 years old at the time. She didn’t want to be left out. She had a business finding the right color clothing for your skin tone—we all participated and loved her advise and tenacity. Maybelle always participated in the garage sale—from the very first one on Topaz. Selling her “blue willow” china and other wonderful things. After I lost my rental house on Topaz to progress, Maybelle became the guardian of some of my plants. She became so attached to them that I didn’t have the heart to ask for them back. Progress eventually caught up with Maybelle when her landlady passed away and the relatives sold the house. As so often happens, the rent goes up and wonderful people like Maybelle leave us. Her little house has had a few upgrades, but still looks pretty much the same as when Maybelle lived there. It makes me think of her every time I walk by. Now for the sad part. I always intended to find out where she went and visit her. I knew it was to a local nursing home. I never did make it there to see her. I really regret that. Intentions are not actions. When I read Maybelle had passed away on April 27th all these memories came flooding back. And the regret. And a huge reminder that there are other people that I need to take a few moments to stop in and see on a regular basis. To make sure they know that they are important. I just hope Maybelle is looking down from Heaven and can see that she is missed and that I do think of her often. She was a woman who is still an inspiration to me. I hope to be living, caring and doing like Maybelle and others like her for many years. The Balboa Island Museum and Historical Society is a non-profit organization formed by Island residents. Our hope is that visitors and residents will have a place to remember and enjoy the history of the Island. We are just beginning and are collecting memorabilia of all kinds including photographs and stories. We welcome any material that you might have. The Balboa Island Museum and Historical Society is located at 502 South Bayfront, Suite A, Balboa Island, Ca 92662 949.675.3952. Come and visit us during our hours of operation which are Wednesdays and Saturdays from 10:00 am to 2:00 pm. We are always looking for volunteers to staff the museum during those hours. Get involved—Balboa Island is what it is because of past and present volunteers. If you can’t volunteer—make a donation—it is tax deductible!! 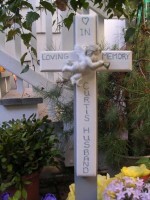 This handmade memorial cross was made for the planter at Garnet and North Bayfront. It is hard to believe that anyone would intentionally take such a personal and sensitive item, however; it has been missing since around April 20th. I would hope that anyone who reads this and knows the whereabouts of the cross to PLEASE return it to where it belongs. This Adopt a Pot is dedicated to the memory of my 28 yr old nephew, Curtis Husband. Thank you!! From the “desert to the sea’ - the Island life’s for me!!! Having just returned from yet another travel ’expedition’, it occurred to me just what a magnetic lure this quaint community holds over me. I recently resided on Coronado (our much larger neighbor to the south— home to the Navy Seals and pristine white-sand beaches) and soon to visit our other neighbor ’26 miles across the sea’ - Catalina Island. My distant dream-travel islands include French Polynesia, plus the Christmas and Society Islands, below the Equator. Yet I always feel back at home the moment I driver over that bridge—every single time! In fact, I landed back here for our delightful annual BI Parade, which was a joyful event as always. The weather was idyllic on Sunday and the crowds larger than ever. I always feel such pride at the sign and sound of our Newport Beach Fire Department force—horns blaring—approaching Marine Avenue. We are Very Lucky to Live Here!! Hope you all made it out to South Bayfront to the Art Walk. The paintings on display were predictably fantastic and I was even more amazed by the many gifted Artisans this year displaying hand-crafted jewelry. Some truly stunning pieces were to be found. Other recent happenings: Heart of the Island - Only the name has been changed (formerly Sally Huss Gallery). Gracious owner ‘Audrey’ is carrying the very same local Island artists as before—just many more of them! She decided the name-switch lent more ‘non-specific’ appeal to her merchandising. Hey Island Gals!!! Summer is summer is fast upon us and we all want to get into “bikini shape” - right? Stop by our local fitness specialists at Island Pilates (rear Courtyard—307 Marine Avenue) and meet my pal owner ’Karen’. She is pleased to announce that internationally renowned Pilates Master Trainer, Israeli-born Rahamin Ron has recently joined her studio and is currently available in-studio for private sessions. All of her staff are trained under his highly effective method. Volunteers wanted now: 12 dedicated, serious-minded individuals interested in learning ‘how to work yourself out at home’ - under Rahamin’s direction Fantastic opportunity!! Please call 949.675.8400 to sign up. Off to more great places—see you next time!!! Once it was common practice to flush unwanted medications down the toilet. Scientists now know that these substances are bad for our environment—the ground water, and air around us. Here are a few options for disposing of expired or unwanted medications. Drop-off medications at your local hazardous waste collection center. Visit: http://www.nodrugsdownthedrain.org for locations and details on the program. Put in a sturdy, securely sealed container then in a trash can where children and animals can’t reach them. Protect your privacy—remove your name, drug name, prescription number and other personal information from the container before disposal.